When it comes to bench pressing, powerlifting is a game of inches. Where you space your hands could make the difference between gains and stagnation. 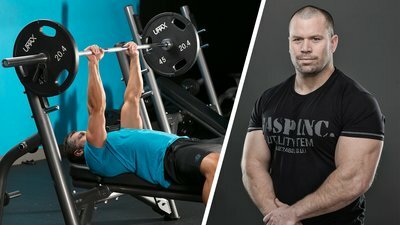 Q: I've noticed that some champion bench pressers use a narrow, shoulder-width grip, while other champions go wide. I'm an aspiring competitor myself. Where should my grip be? Several of my champion bench pressers found that a narrow grip works best for them, but they didn't come by it lightly. Any bodybuilder will tell you that varying your grip by just an inch can alter the recruitment level of muscles involved in bench pressing. So, if they both chose a narrow grip, you know it's got something going for it. In general, triceps recruitment is greater with a closer grip, whereas sternal pec recruitment may slightly increase with a wider grip. Purely from a performance standpoint, lifters with stronger triceps will hoist more with a narrower grip. A wider grip works better for someone who's done a lot of wide-grip chest pressing and chest-isolation movements. Those with boots on the ground in the iron game have always believed a narrower bench-press grip does a better job of preventing pec tears and shoulder injuries. In 2007, the folks in the lab coats validated this tenet of "bro science" in a landmark study, "The Effect of Grip Width on Bench Press Performance and Risk of Injury." This Strength and Conditioning Journal study showed that shoulder torque was 1.5 times greater when bench pressing with a wide grip compared to a narrow one. Everything has a risk-to-benefit ratio, but if you're starting out in powerlifting or lifting recreationally, I highly recommend you stick with a narrow shoulder-width grip. If you're very experienced and going for a world record, you know the risks and benefits of your grip by now. Most lifters know that triceps play an important role in creating better initial drive off the chest at the start of the bench. This is especially true with raw bench pressing, where speed off the chest is crucial. As I suggested in my article about finding the right deadlift stance, finding your best bench-press grip comes down to relying on your body's innate wisdom. All you must do is get down on the floor and assume the push-up position. Your body is smart, and will intuitively put your hands in your strongest position. Measure the distance between your index fingers, then duplicate this distance on a barbell. More often than not, your hands end up in the shoulder-width range. Perform this test, and use this grip position for a minimum of six weeks of training. From there, and through some trial and error, you'll be able to find the exact grip position to build your strongest bench press. I learned this trick from strength sensei Charles Poliquin many moons ago and it hasn't led me astray yet. Green, C. M. (2007). The effect of grip width on bench press performance and risk of injury. Strength and Conditioning Journal, 29(5), 10.